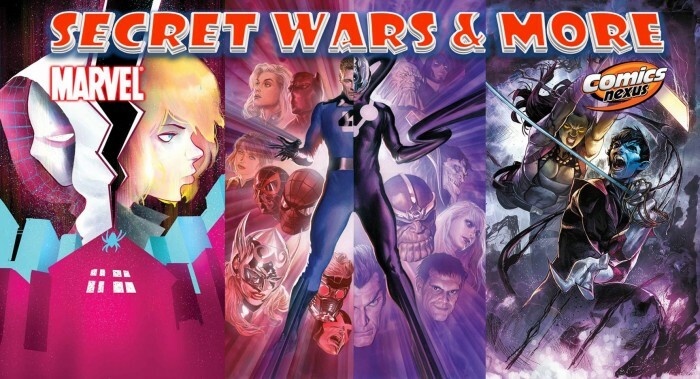 Secret Wars 2015 & More Roundtable: Marvel Comics June 2015 Solicitations Pick Over With Star Wars, Spider-Man, Avengers, X-Men & More Spoilers! The Comics Nexus and InsidePulse team weigh in on Marvel Comics’ Secret Wars and More June 2015 comic book solicitations. The only things I’m slightly interested in checking out are Wierdworld and X-Men ’92. I have absolutely no interest in Secret Wars and Battleworld so I will only get them if they aren’t a cheap event tie-in. That said, I will be getting House of Hem because hey, Fred Hembeck! That Werewolf by Night Deluxe Hardcover Omnibus is tempting too. I have the Marvel Essentials of that series, but this will be in colour, better bound and hardcover. Arrrgh. I have almost no interest in the rest of this event however. Too many of the tie-ins reek of fan-service, or Elseworld-ishness, and like DC’s Convergence, I think I’m going to pass on all of them. Unlike Convergence, some of these tie-ins are being done by creators I consider ‘buy-on-sight’, so I’m not sure where I’ll stand come June. Ms. Marvel #16 – I hope that the ‘Last Days’ branding doesn’t mean the title is being cancelled. Captain America & The Mighty Avengers #9 – Here’s hoping that this series continues after Secret Wars. Ideally, this book would get to exist outside of endless event tie-ins, which have done so much to keep this title from being as great as it could be. Bucky Barnes: The Winter Soldier #9 – I cannot stop talking about how amazing Marco Rudy’s art is on this book! Thors #1 – I like Thor now (which is not normal for me), but don’t know if that means I want to commit to a thunder god version of Spider-Verse. If this continues Jason Aaron’s story about the new Thor, I might end up feeling compelled to get it, but if this is just filler, I’ll pass. Ultimate End #2 – I can’t decide what is going to win, my love of Miles Morales, or my strong dislike of Mark Bagley’s art. Right now, I want to know how the Ultimate Universe ends, and what happens to Miles, but I really wish this had a different artist attached to it. 1602 Witch Hunter Angela #1 – I love Kieron Gillen’s writing, to the point that I’m actually buying the regular Angela costume, despite hating the character, but I get the feeling this is more Marguerite Bennett’s book. Also, I hate that they are making 1602 versions of the Guardians. This sounds very paint-with-numbers. Squadron Sinister #1 – I love the Squadron Supreme, but no one has handled them properly since the 80s. Still, Carlos Pacheco is drawing this, so it could be good. Old Man Logan #2 – I didn’t love the original Old Man Logan storyline, but this is drawn by Andrea Sorrentino, who is amazing. Ghost Racers #1 – This sounds like a great concept, were it not taking place on Battleworld. Also, I don’t know these creators, so I’m too reluctant to dive in. A-Force #2 – I’d happily buy an all-female Avengers comic, but the Secret Wars tie-in angle makes me not want this. Also, I don’t trust Bennett as a writer yet, so even though G. Willow Wilson is on this, I’m probably not. I had read All-New X-Men, but – and I think James Fulton and I agree on this – it just became just another x-team instead of finding ways to mine the whole time-displaced-teens-thing. The All-New X-Men would or should have a unique voice during Secret Wars, but we’ll see. I understand this book is one of 33 Marvel is canceling for Secret Wars and that writer Brian Michael Bendis will be moving on. Not sure what the post-Black Vortex / post-Secret Wars take on the All-New X-Men will be. The only other Marvel title I read was All-New Invaders, but Marvel cancelled that too. I love writer James Robinson and loved his modern day take on Marvel’s core Golden Age icons (interestingly the Invaders was a 1970’s concept focusing on the WWII era Marvel heroes). So, with that, I have reviewed Marvel’s June 2015 Solicitations and neither of writer James Robinson’s titles interest me: Secret Wars – Armor Wars and Secret Wars: Age of Ultron vs. Marvel Zombies. However Squadron Sinister #1 looks compelling from the writer / creator Marc Guggenheim behind CW Arrow (an awesome TV show). So I’ll sample this. I’ll also pick up the main Secret Wars mini-series, issues #3 and #4 in June, despite the sparse / meaningless solicit copy; however those Alex Ross covers focusing on Mr. Fantastic and Dr. Doom are awesome. Curious how Marvel will do their version of Crisis on Infinite Earths. Spider-Verse #2 seems like a good bet. Gwen versus Norman Osborn. Even they’re versions from a different dimension, it’s still a pretty significant book. The thought of Gwen punching Norman out certainly cheers me up a bit. There’s a good probability I’ll pickup M.O.D.O.K. Assassin a try, as I’m a huge fan of that character. A-Force will get a try too thanks to She-Hulk’s prominent prescience. I’ll happily stick with Star Wars, Darth Vader and Princess Leia. Those comics have been money each time. I will be skipping The Last Padawan though since I’ve never watched the Star Wars Rebels show. Amazing Spider-Man 19.1. I enjoyed the opening chapter of Spiral this week, and with Issue 19.1 we get the Circus Of Crime! I love the vintage, bizarre Spidey villains, so there’s no way I’ll miss that one. Other ongoing series that I will continue to buy: Howard The Duck #4 (especially with a Doctor Strange appearance), Silk #5, Spider-Woman #8 and Spider-Gwen #5. So, I guess there are a few June comics I’m looking forward to after all! A million thanks to Marvel for really helping me pare down my regular list. I’m not counting the usual fare (aside from CAP/MIGHTY #9), just the SW tie-ins. Simply because I’m a sucker and curious to see the direction the main mini wil take. One of my monthlies. I love the quirkiness behind it all. At times, this feels more like defenders in the sense of being a “non-team”. I’m real curious to see if this is a set-up for NEXTWAVE. I’m a feminist at heart as well as an Avengers admirer. I’m absolutely certain this series will stick around after the War. Skottie Young writing and illustrating? WOOT! Looking forward to seeing major temper tantrums here!! I used to gush over DP a few years back. I like him enough to read the minis that Cullen Bunn has produced from his ever-frenetic mind. Comedy at its best with sprinkles of gore, violence, danger, and excitement. I am completely turned off…it’s not the change but look at the solicits nothing makes me want to run out and buy it…even from a pure fan or nostalgia perspective. I’ll wait out the books I have always read like the core Avengers and X-Men titles hoping for something more substantial than cosmetic tweaks to the Marvelverse post “Battleworld“. I am enjoying the “incursion” mega story in Hickman’ Avengers books. I was hoping the end game had more umph than Battleworld to be quite honest. I’m more excited by leaps and bounds by the news of Immonen taking over art chores on Star Wars after Cassady. That book really did a good job of capturing the heart of Star Wars.